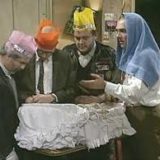 Bottom was created by Adrian Edmondson and Rik Mayall. The show depicts the sad lives of the two flatmates Edward Elizabeth Hitler and Richard Richard and follows their many ridiculous adventures. The show is noted for its chaotic, nihilistic humour and violent comedy slapstick. 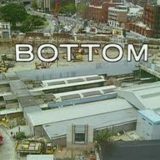 In 2004, Bottom came was ranked 45 in the “Britain’s Best Sitcom” poll by the BBC. Holy – It’s Christmas day and Richie is cooking the dinner and all his mates are invited. Dave Hedgehog and Spudgun arrive to find that Christmas dinner is slightly below par. Never mind, because later Richie is revealed to be the son of God. Contest – Eddie comes home from a very bad day at work and Richie finds Eddie is not paying the rent and has only got $11.80 which he has spent on an adult magazine. But Richie finds Eddie has put on a bet on the Miss World contest on TV.